Shorebirds (in Europe: waders) must be an acquired birding taste. No one starts birding dreaming of drab-coloured, unobtrusive and, far on a mud-bar, largely invisible little mud-skippers. In Europe, people start birding when they see a Common Kingfisher or a Golden Oriole, hoping to see more jewels like that, but not a Wood Sandpiper. Who even spots a Woodsand without deliberately searching for birds? 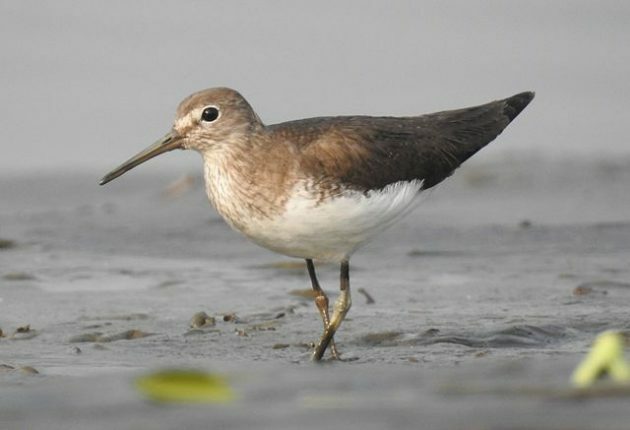 In my early birding days I did learn Common and Green Sandpipers (cover photo) from a kayak cockpit because the first is common on the Danube shores and the second in its backwaters. And I learned Northern Lapwings and Eurasian Curlews because they are big, obvious and visible from a car. But all those Calidrises and Tringas in between… no. Occasionally I would see this or that shorebird and still remember how uncertain of its ID I was. And it wasn’t so long ago. I started to learn how to tell waders (and gulls) apart only when I locally ran out of other hard bird groups to tackle. When there was hardly much else left, I accepted the shorebirds. The game-changer was the new scope, Swarovski 25-60×65 STX, which truly allowed me to follow those tiny tracks in the mud. It is a bit funny, now when I look back, they aren’t that hard at all, most of them at least, yet I was running away from them for so long. It’s a bit like me and chemistry. I didn’t study biology after high school because I told myself: no way I could possibly pass the chemistry! Quarter of a century later, I jumped at an opportunity to study environmental sciences, and guess what awaited me there? Yes, that very same bloody chemistry from which I have run for half of my life. And it was still hard and I barely made it. But I made it, nevertheless. The same with shorebirds… no, not the same. To me, IDing shorebirds is still way easier than passing chemistry. But once you start following those unobtrusive little drab-coloured mud-skippers, there is no turning back. Where to find shorebirds around Belgrade, Serbia? A biologist friend of mine recently moved from New Jersey (where she visited the estuaries to study hundreds of thousands waders at close range) to Belgrade where I showed her some inland birding sites with two shorebirds here and one or two more over there. You should have seen the disappointment in her eyes. So I showed her a few shorebird sites, nothing that could possibly match ocean estuaries, but the best around the city, the same ones I will describe to you. What to expect there? Anything from a few dozen birds on a bad day to a few hundred on a good day and from a thousand onward (maybe up to ten or twenty thousands on autumn migration in late summer). So far, 33 species have been eBirded in Serbia. Let me add that the only ever ringed Critically Endangered (yet, possibly extinct) Slender-billed Curlew was ringed in northern Serbia (Carska bara Ramsar site) in the 1970s. 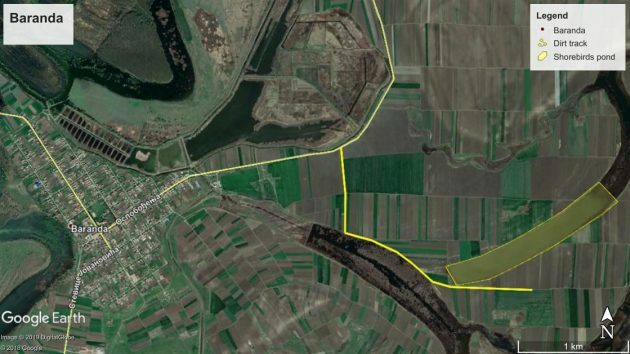 The best shorebird sites around Belgrade, west to east, are sugar plant ponds near Pecinci, Pecena Slatina pond in the Baranda Village, and the sugar plant ponds near Kovacica. The “Donji Srem” Sugar Plant lies south of the village of Sibac (between Sibac and Pecinci), about 50 km west of the city. The sugar plant is operational and the ponds can be quite smelly. There are three large ponds and several smaller. The large western pond is too deep for shorebirds, so focus on the shallower eastern one. Pecena Slatina pond by the Baranda Village, about 40 km north from the city, lies east from the local road connecting Baranda to Sakule. Technically, it is a part of the Baranda fish farm, but being a complex of nowadays brackish oxbow lakes, they are not used for carp production and the access is not restricted. Still, local hunters shoot waterfowl here, so be extra careful from September to February, especially on weekends. The turn off is not marked and can be hard to spot. 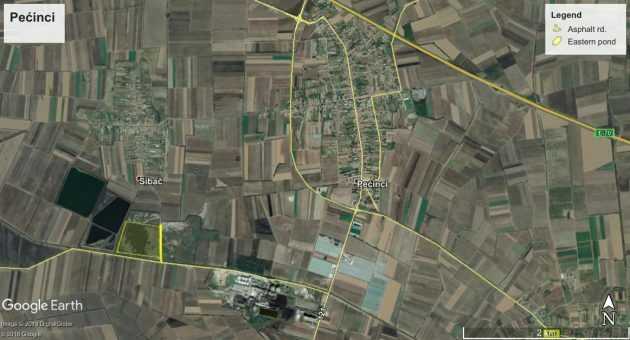 It is in the first bend in the asphalt road north of Baranda, where a dirt track goes right between arable fields towards a hillock (the highest point in a flat landscape). At the time of writing (early April), the track is passable for low clearance cars, but may easily deteriorate with the first tractor passing after the rains. 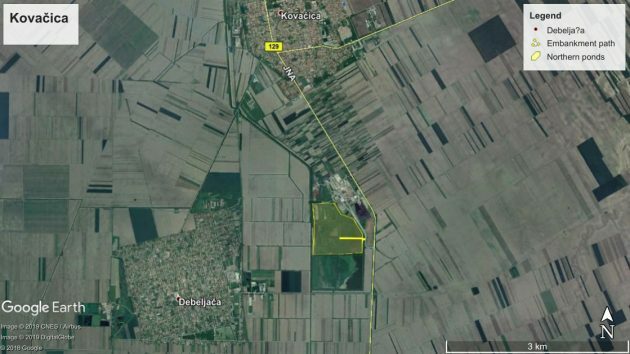 The “Jedinstvo” Sugar Plant ponds lie between Kovacica and Debeljaca villages, about 40 km northeast from Belgrade. The plant is operational and the ponds can be quite smelly. It lies just north of the Debeljaca turn off. You can park there and visit the ponds on foot (visible as the low embankment on your left-hand side), or use the next turn off for the plant itself, in which case be sure not to block the road for large lorries heading for the plant gate.